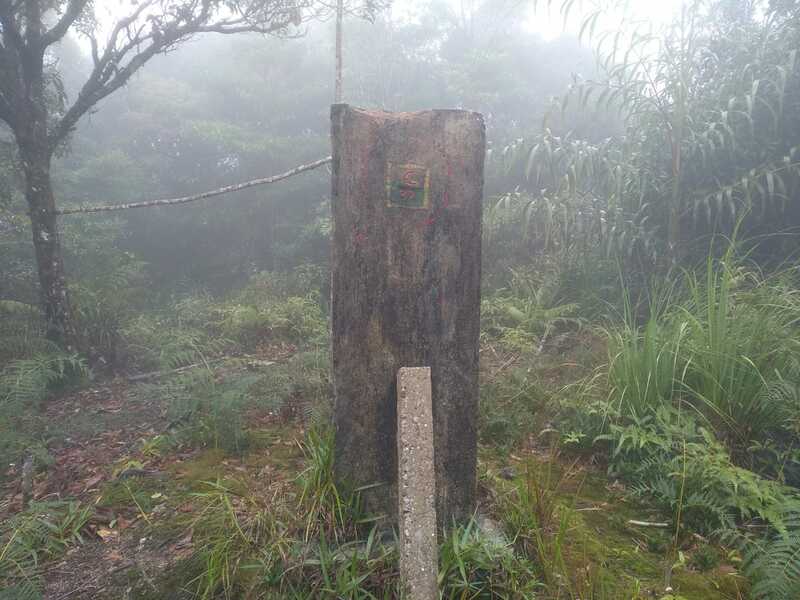 Gunung Kalijau or Kalimaoe, 1,216m. 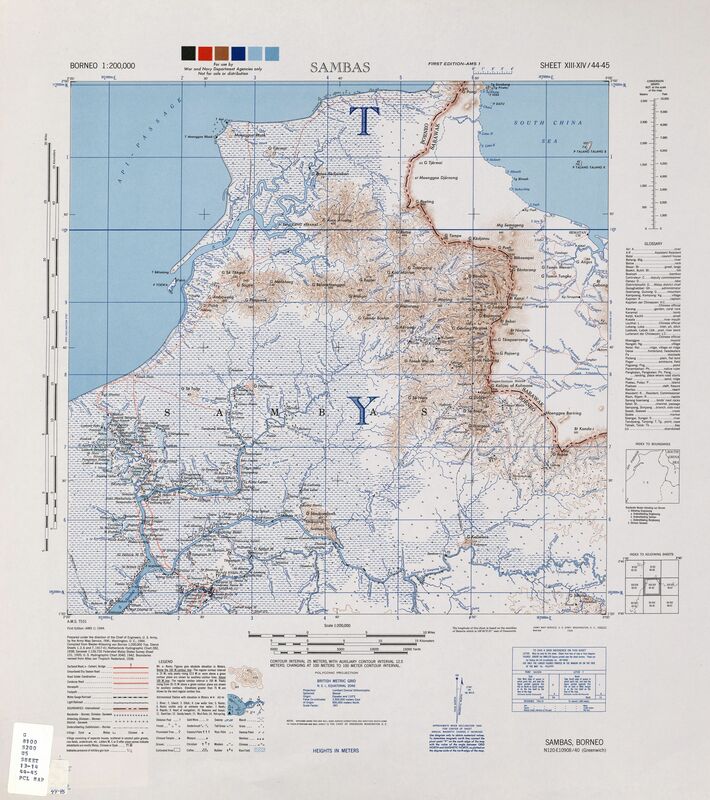 It is certainly clear that Kanyi is considerably higher than all the others, and the high point currently marked Gunung Rumput on Google Maps and Google Earth is actually Kanyi. 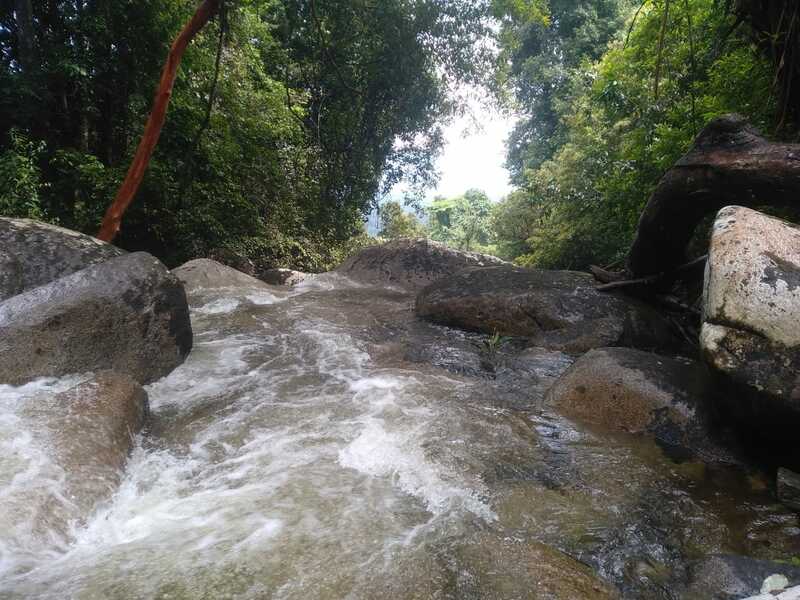 Given that there are so many different names, we have decided for the time being to refer to the mountain range as Berumput or Rumput and the actual highest peak as Kanyi. 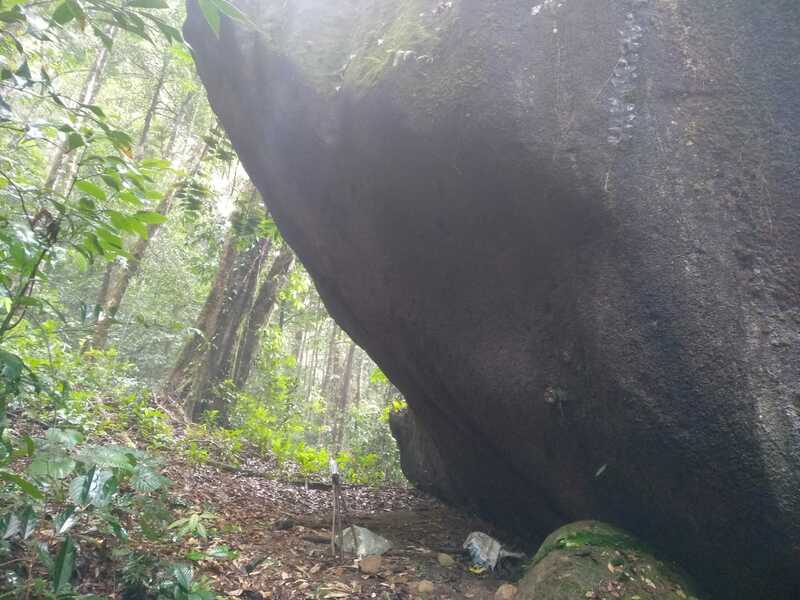 It is possible for fit hikers to climb Kanyi in 2 days from the Malaysian side at Kampung Sebako (east of the peak) and the super-fit can easily do it as a dayhike if they set out early enough. Like nearby Gunung Gading, this is a great spot to potentially see Rafflesia. Wilson Chin and friends reached the summit of Kanyi in 2015 and Mykhailo Pavliuk ran to the top in early January 2019 in just 2 hours and 32 minutes! GPS reading at the start was just 25m and at the summit was around 1,574m. There is a large pillar at the top, presumably from the British era. There is a moderately difficult river crossing not far from the start, but beyond that the forest trail has a gradual gradient. Like all the peaks listed above, Kanyi is on the borderline between Indonesia and Malaysia. 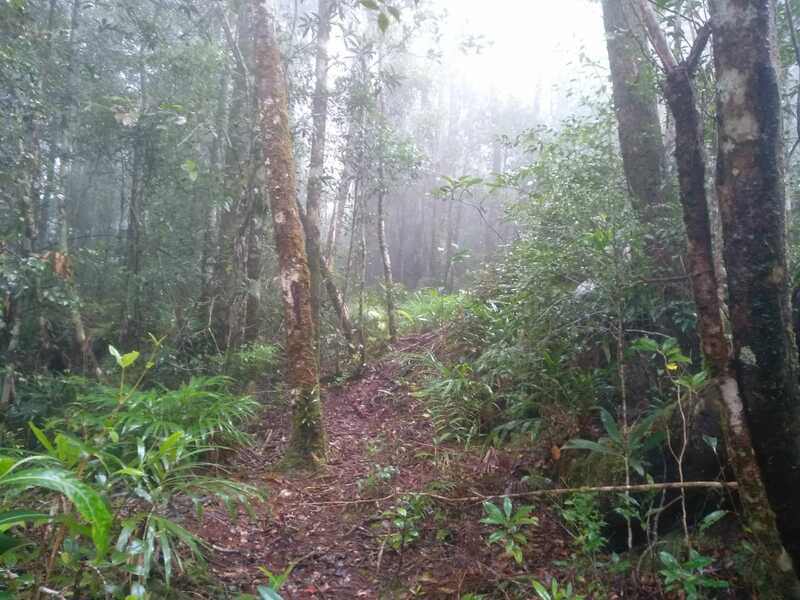 There is a trail up from the Indonesian side at Batu Hitam but not much is known about it. There is an excellent viewpoint for the entire range at Bukit Gondol, Pugu beach, near Lundu, Sarawak. A little 85 metre high hill but with fabulous views, especially in the late afternoon and for sunset. 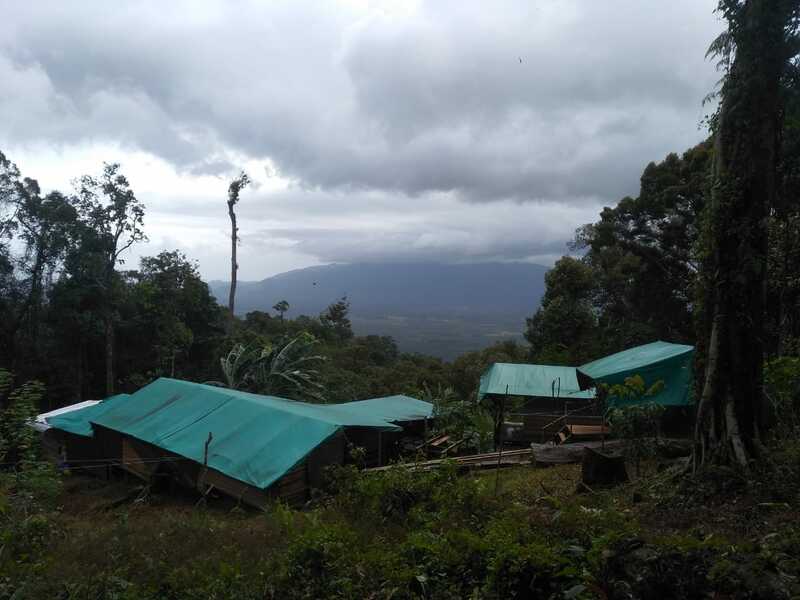 Berumput/Kanyi is the backdrop, with a couple of minor peaks in the foreground, according to old topo maps Gunung Tamin Menari and Gunung Tamin Tungku, just to the east of Gunung Bentaran. We aim to reach this top and update the write-up in July 2019…. Getting there: The nearest city is Kuching, and Kampung Sebako is about 2 hours by car from there. 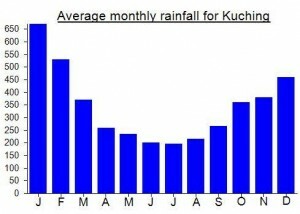 Accommodation: Plenty in Kuching and one or two places closer by in Lundu. Permits: Currently not required, but take a local guide with you. ‘Berumput’ means ‘grassy’ in Indonesian. 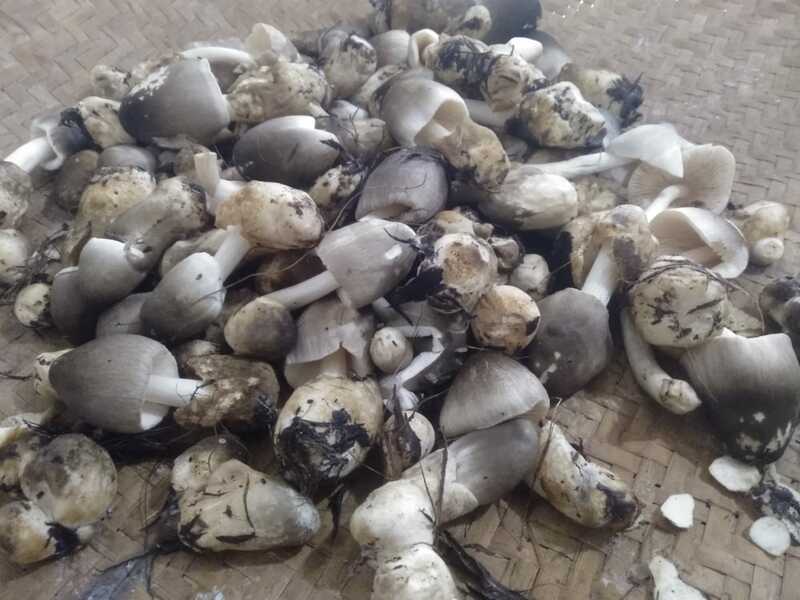 Kalimantan Barat Kurang Tinggi. permalink. well, this mountain is one of my target to explore. For Rumput/Berumput – or Pueh as it is known over in Malaysia – I had little information to go on but one contact at an adventure travel company in Kuching asked to meet so we could discuss a 3-day trek to the peak with one of his guides from the local area called Manshur. I was ready to ask him all the usual questions and took some extra money to prepare for paying a deposit. Well, I waited and waited for this contact to meet at the arranged place and he never arrived, even late, and never sent a message until the following day to try to negotiate a second meeting. With lack of reliability like that, how can one trust such an individual to organize a 3-day trek? As with all multi-day treks in Sarawak, the cost is likely to be prohibitively high for ordinary travellers who are on their own or even in a small group. Your best bet is perhaps to try asking in Lundu. You could try Manshur +60 138448726. 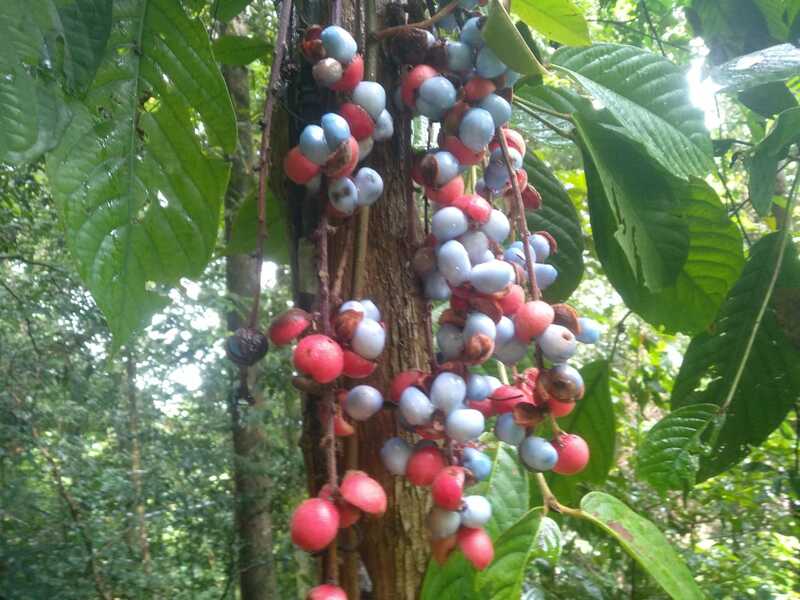 Otto Steinmayer who lives in nearby Lundu notes that in the 1860s the naturalist Odoardo Beccari climbed Pueh and spotted Rafflesia (very famous at Gunung Gading nearby). Dan, thanks for the info. My team and I plan to climb berumput on the end of Aug 2017, and hope that we are able to reach Manshur to get him to guide us to the summit. “Mount Pueh was known to biologists for the collections made there by Eric Mjöberg (1882–1938), a Swedish naturalist, who was Curator of the Sarawak Museum between 1922–1924. Mjöberg’s herpetological collections from Gunung Pueh between October to December 1923, and other localities in Borneo, were reported by Smith (1925). Mjöberg, unfortunately, left little by way of written records, of his ascent of Pueh and the collections he made. Looks like the 800m+ peak of Gunung Santubong near Kuching is worth a climb too so I’ll probably attempt from the Malaysian side unless I hear otherwise….